Roads to the Great War: How the War Was Lost: The Food Weapon? It is true that Germany imported 20–25 percent of calories for human consumption before the war. Wartime imports were limited by an Allied blockade at sea and (via pressure on neutrals) on land. 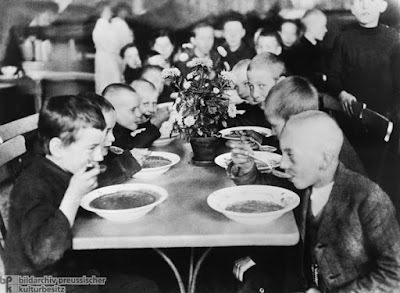 At the same time, German civilians suffered greatly — hunger-related mortality is estimated at around 750,000 (Davis and Engerman 2006: 204). But decisions made in Berlin, not London, did the main damage to German food supplies. The decision to attack Germany’s main food suppliers struck the first blow. In 1913 the German economy was more interlinked with future adversaries than allies. Britain, France, Italy, and Russia accounted for 36 percent of prewar German trade. Britain alone provided more German trade than the 12 percent share of Austria‐Hungary, Bulgaria, and the Ottoman Empire combined (Gartzke and Lupu 2012, Kramer 2013). Hunger played a major role in Austria-Hungary's collapse. The Austrian half of the dual monarchy was dependent upon the Hungarian Kingdom for a large amount of foodstuffs. According to Gordan Brooke Shepherd in the Last Habsburg, the threat of an embargo of those foodstuffs caused the new Emperor, Karl, to take the Hungarian Coronation oath, which guarantees that the kingdom will remain territorially intact. This meant that Karl's efforts to reform the Empire could not deal with the Hungarian half. German starvation played a pivotal role in the failure to press the Spring Offensive. Many soldiers stopped to raid the depots of the British and French overrun in the first days. Diseas also worked against the Germans. The flu pandemic had major impact on all armies. The lack of proper diet played made the flu epidemic a greater drain on Germany than the Allies. This article seems to presume that these internal and external factors were mutually exclusive, which they were surely not. Nor would anyone consider the loss of 25% of their food imports insignificant. I agree with Brian's comment too.